Pokemon Yellow, the special Pikachu edition is a remake of Pokemon Red and Blue. It's story is more in tune with the anime than it's predecessors for example straying from the traditional grass, fire, water starter and being able to take Pikachu instead, just as Ash once did. During a Nintendo Direct announcement on November 12th, 2015 it was revealed that Pokémon Yellow would be released for the Nintendo 3DS virtual console to celebrate the 20th Anniversary of Pokémon. The release date was set for Feb 28th, 2016. 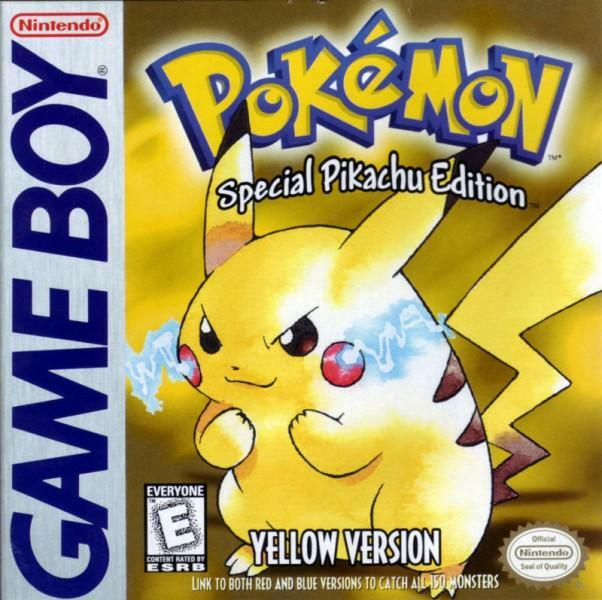 Pokémon Yellow although released at the tail end of the Game Boy era, managed to bag the title of second best selling Pokémon title on the system. Yellow was outsold only be the cumulative effort of Red/Blue/Green, but as no one seems to know the breakdown of how many each individual version sold I'd say Yellow and its 14.64 million sales could've even been #1. In previous versions the player stopped just before the fall grass, they now step into the first patch of tall grass when Professor Oak comes along and enters the tall grass beside the player. Oak is engaged by a wild Pikachu and promptly catches it before accompanying the player back to his Lab in Pallet Town. When the player reaches Oaks Laboratory, there is only one Poké Ball on the desk, where there would previously have been three. Oak tells the player to take the Poké Ball (which contains Eevee) but is shoved aside by Blue, his rival (Gary from the Anime really) who takes it instead. Oak has only one other Pokémon immediately available for the player to take.... the Pikachu he just caught. After the players first battle against Blue, Pikachu briefly returns to his Poké Ball only to then break free and refuse to return, he follows the player on foot from then on. You have to speak to the old man in Viridian City before you can go to Viridian Forest. He's a grumpy fellow, but deep down good hearted and attempts to demonstrate to the player how to catch a Pokémon, attempts however being the key word here. The Old man fails to catch the Pokémon, and he's out of Poké Balls so he travels to the Poké Mart for more. If you visit the Poké Mart and speak to him you can get him to show you again. Encounters with Team Rocket have also been adapted to coincide much more with the anime, Jessie and James, the diet coke of villains from the anime make frequent appearances throughout the game. 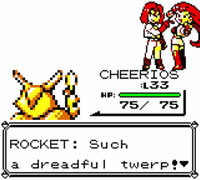 They replace the generic Team Rocket Grunts and are referred to as 'Rocket' but their sprites are quite unmistakable. The front sprites of all Pokémon have been updated to fall better inline with the games official artwork by Ken Sugimori. The back sprites however remain unchanged from Red, Green and Blue. There have been a few modifications to minor visual elements around the Kanto region for example doors, windows and signs look a little different. In line with the anime, all generic Pokémon centre staff were replaced by Nurse Joy and a Chansey. Likewise the entire Police Force is now made up of Officer Jennys. Blaines sprite has been updated on the overworld, and now shows him in glasses. 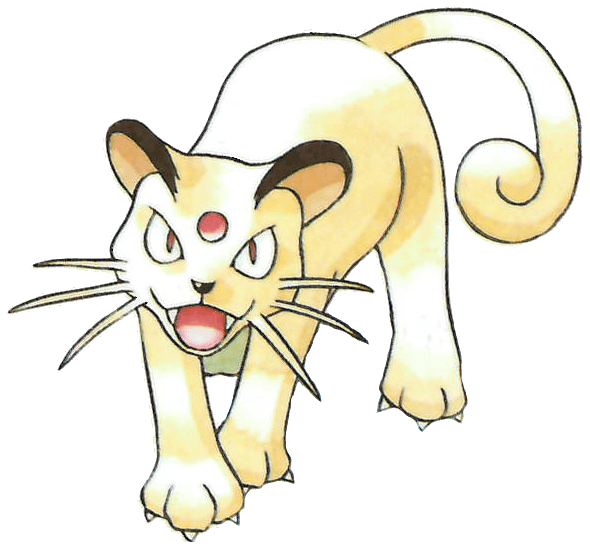 During your encounter with Giovanni at the Viridian Gym he uses a Persian, which is a reference to the Persian who is often with him in the Anime. Many Trainer Sprites were updated too, Red and Blue were updated to look more similar to their official artworks used in manuals, strategy guides etc in Japan. Misty and Brocks sprites have been updated so that they look more like they do in the anime, Misty loses the Bikini and gains shorts and a shirt and Brocks outfit recieves updated colouring. Pikachu now has its own unique icon on the party screen, and he, Oddish, Bulbasaur and Sandshrew also got new overworld sprites. Nurse Joy and Officer Jenny as they appear in the Anime. They return to their posts in Pokémon Yellow. An additional Lass and a Bug Catcher can now be found in Viridian Forest. A male and female Jr. Trainer on Route 6 are replaced by characters resembling Joe and Giselle from the anime. A Jr. Trainer on Route 9 was replaced with a Youngster, which references A J, the Sandshrew trainer from the Anime. Route 19 now has the addition of the summer Beach house where the Pikachu's Beach mini game can be played. This mini game was shown in The Pi-kahuna episode of the anime. Pikachu and Raichu are no longer available to be caught in the wild, so the only Pikachu in the game is the starter one, and that can't evolve (just like Ash doesn't make his evolve in the anime). When Ash first starts his Pokémon Journey in the anime he catches a Pidgoetto and a Caterpie in Viridian Forest. In RBG you could get Weedle or Caterpie in Viridian Forest, in Yellow you can only get Caterpie, additionally Pidgey's and Pidgeottos are now found there too... leading the player to take a similar capture path to Ash in the beginning at least. All the Kanto starter Pokémon; Bulbasaur, Charamander and Squirtle can be captured in the wild in Pokémon Yellow, to tie in with the fact that Ash caught all 3 in the anime. Abra could previously be found in various routes at the top of Cerulean City. It can now only be encountered at the routes immediately surrounding Saffron City. Koffing, Ekans, Meowth are well known as being Jessie & James' Pokémon in the anime, and as such are not available to catch in game - keeping them as 'bad guy' Pokémon as they are in the anime. Farfetch'd and Lickitung which could only be obtained by ingame trades in previous titles are now available in the wild. This is testament to Ash encountering a wandering Farfetch'd in the anime (that helped rob him, if I remember right) and Jessie and James encountered and captured a Lickitung. You can't choose between the normal Kanto starters, guess you got out of bed too late huh? Instead you have to take Pikachu because he's the only one left. But theres a problem with this Pikachu, he hates his Pokéball and insists of travelling about by the players side (Sound familiar?). Likewise Pikachu has a cry that sounds just like Ash's Pikachu from the anime. The voice actor for the cry is Ikue Ohtani. You can't evolve your starter Pikachu, nor can you release it into the wild. Ash never made his Pikachu evolve, even when it wanted to in order to beat Raichu in the anime so this ties in with that fact. Additionally Ash tried to release his Pikachu to stay with a load of other Pikachu's but it returned to him, hence not having the option of releasing it. - If the player is defeated both times, or runs from battle twice, Eevee becomes Vaporeon (presumably to give the player a type advantage and better shot at victory the next time they meet). A primative friendship gauge features in Pokémon Yellow, which simply tracks Pikachu's feelings towards the player. Gym Leaders teams are comprised of slightly different Pokémon, to bring them more in line with those that appear in the anime. 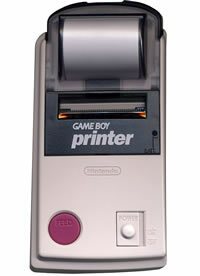 Game Boy Printer compatability is added for the first time. The Cable Club recieved a new mode; Colosseum 2. Technical Machine (TM) compatability is changed for some Pokémon, like Charizard who can now learn Fly by use of HM02. In the vast majority of cases the Pokémon excluded from Yellow tie in with either encounters Ash has had with that type of Pokémon, or decisions he's made regarding them. So we start out with Weedle, Ash encountered one but didn't attempt to capture it, however went for Caterpie as soon as he saw that - this kind of eliminates Kakuna from proceedings, and I'm sure we all remember the Beedrill incident from the anime. The next ones are quite easy, Ekans, Arbok, Meowth, Persian, Koffing and Weezing are all Pokémon used by Jessie and James of Team Rocket, so thats why they were excluded. 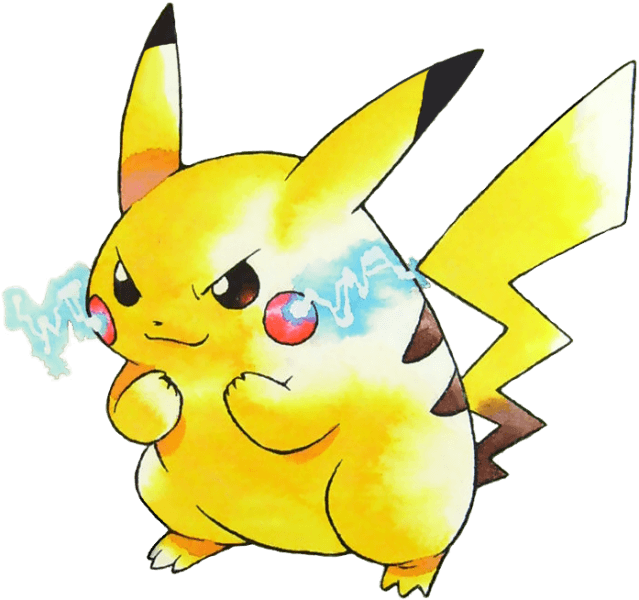 As for Raichu, when Ash took on Lt. Surge and lost, his Pikachu was so frustrated that it wanted to become Raichu so it was strong enough to battle Surges Raichu, but the pair decided that their bond was more important than the raw strength gain obtained by evolving into Raichu. As for Jynx, Electabuzz and Magmar, I think Jynx may simply have dropped due to controversey over it's sprite, Electabuzz I'm not too sure on, and Magmar I think was due to the fact that Ash had his Charizard in his team as a fire type at the point when he encountered Magmar in the series, lessening his requirement for a strong fire type such as Magmar. Prepare for trouble, and make it double. Team Rocket are back, and this time its not generic grunts - Jessie and James. Although their names come up as 'Rocket Grunt' their sprites are very distinctive and it's obviously them. Check out the image of Team Rocket from the Anime on the left, and the encounter sprites on the right. 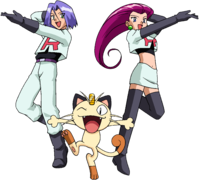 Additionally Team Rocket are well known for referring to Ash as 'the twerp' in the Anime, and many of their sayings have been added to the games dialogue. Like in the Red, Green and Blue versions of the game Team Rocket is still led by Giovanni, and they still commit the same sinister deeds. The only true differences are that said sinister deeds are comitted by some more familiar faces. You can battle each other or trade between two carts via a Game Boy Link Cable. 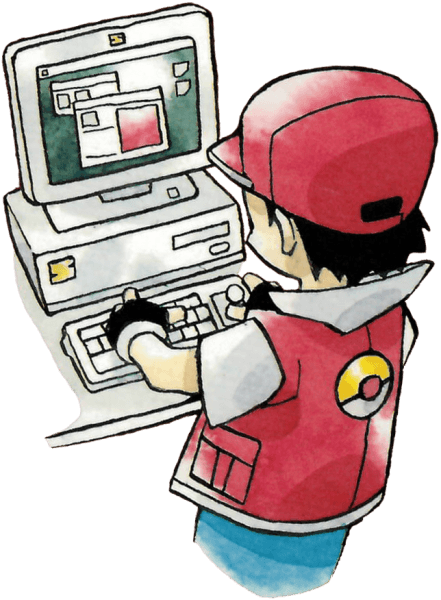 Other benefits of using this feature include being able to trade Pokémon for which trading is an evolution requirement, and trading with other first generation games in order to complete the Pokedex. The Japanese version of Pokémon Yellow can trade with their regional counterparts Red, Green and Blue. The internationally released version of Yellow can trade with the western releases of Pokémon Blue and Red versions as well as other Yellow carts - additionally it would later be able to trade with Pokémon Gold, Silver and Crystal by making use of the Time Capsule feature. Pokémon Yellow is completely incompatible with any games Gen III or newer. Trying to trade between a Japanese and Western cart WILL result in corrupted data, so avoid it at all costs; likewise Battle between them wouldn't work either, but doesn't seem to do the same damage to game data when attempted. Non-Game Boy titles Pokémon Stadium and Pokémon Stadium 2 are compatible with Pokémon Yellow which enables your team from Pokémon Yellow to take on someone with a Gen II cart via Pokémon Stadium 2. As mentioned previously Pokémon Yellow also includes Game Boy Printer functionality which enables the player to print off various stickers ranging from PokéDex entries, print screens of party Pokémon, the Diploma and their highscore on the Pikachu's Beach minigame. Check out these Pokémon Yellow videos including TV Commercials, trailers and the intro/opening video. A piece of music present in the games data files which did not make it to the final release. I believe it would've been used for an encounter of some kind. So we've covered the stuff that ties in with the Anime, but theres also a good few bits that don't. 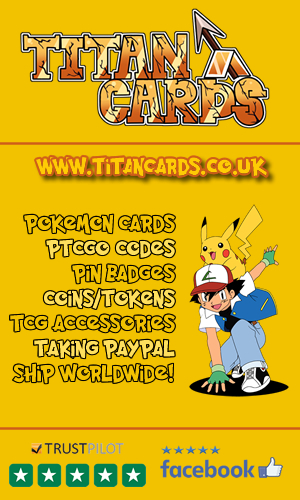 Check them out:- Meowth, thats right! 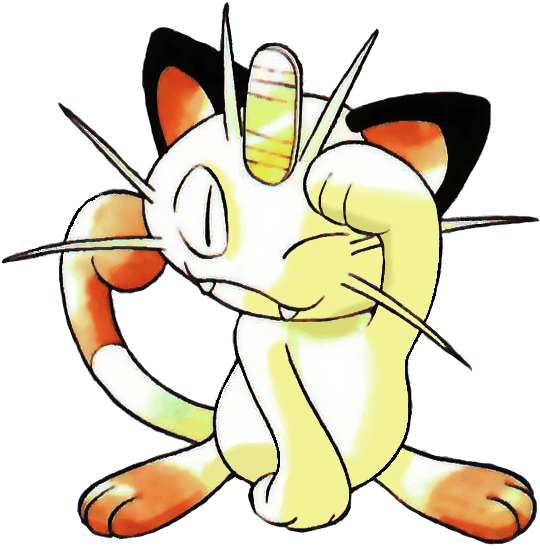 Team Rocket's Meowth talks in the series, but doesn't talk in the game. Likewise in the anime he can't use Pay Day and instead fakes it by throwing Jame's bottle cap collection, whereas in Pokemon Yellow he uses Payday. In the anime Pewter Gym's leader; Brock throws in the towel when he see's his Pokémon losing / being hurt in battle against Ash. In the game however he doesn't quit. Brock doesn't join you on your journey after you beat him. Misty doesn't join you on your journey once you defeat her either. In the anime Ash rescued his Charmander from the neglect of a mean owner/a rain storm, he defeated and captured Bulbasaur in a battle, and Squirtle chose to follow Ash. In the game each of these three original Kanto starters are simply obtained by completing certain tasks and criteria. Pokemon Yellow is to this day the only core series Pokémon title where the player doesn't get a choice between starter Pokémon. This is the only Generation I title where Farfetch'd and Lickitung can be caught in the wild. Other games require trading etc to obtain these two. The starter Pokémon in Yellow are the only ones before Gen V arrived which could be evolved by use of a Thunder Stone (Pikachu and Eevee, your rivals Pokémon). The release date of Pokémon Yellow had been intentionally schedule to coincide with Pokémon the First Movie's release. Pokémon Yellow was a commercial success; selling 14.64 million copies worldwide and netting a total sales of $454 million USD. Prior to it's release Nintendo had already conservatively predicted that the title should earn them at least $75 million usd during the holiday season of 1999. Nintendo's executive of the day George Harrison made another conservative prediction that Yellow's sales would pass the 3 million unit mark, and outsell even popular Nintendo title Donkey Kong 64 - just about George, just about! ;-) The release of Pokémon Yellow coincided with that of the release of Pokémon The First Movie, some partially credit that as a reason Yellow did so well. In the U.S alone Pokémon Yellow recieved more than 150,000 pre-orders for the console + game bundle, where the cartridge on it's own sold more than 600,000 units in the first week of being released and had broken the 1 million sales mark within 14 days. This made gave Pokémon Yellow the title of fastest selling handheld console game of all time. The success of Yellow was acknowledged as having boosted sales of the Game Boy Color overall in the 1999 festive season. As a result of high demand and inadequate supply Target actually publically apologised for not being able to meet what they described as 'unprecedented demand', similarly CNET conducted a survey of videogame stores across the U.S during December 1999 and found that basically none had Yellow in stock. Yellow remains to this day the fastest selling Pokémon title in the United Kingdom (not to be confused with highest overall total sales). Nintendo Power scored it 8 out of 10. Game Informer weren't so impressed and gave 6.5 out of 10, the lowest score Yellow would recieve from any of the major review sites. GameSpot's Cameron Davis gave it an 8.9 out of 10, on the GS scale this equates to 'Great'. His comment "Pokemon - Special Pikachu Edition (Pokemon Yellow to you and me) may be a cynical marketing ploy to make millions of kids buy the same game all over again, but Nintendo has done it so well it's hard to care." had to make me laugh a little due to the distinct element of truth behind it. IGN's Craig Harris loved the game, scoring it a very best 10 out of 10 which is 'Masterpiece' on IGN's scale. Here's a quote from his review: "In case you haven't noticed it, there's a little craze going on in the world with these guys known as Pokémon. It doesn't matter if you love 'em, hate 'em, or drop-kick 'em, you've at least heard of them, and they're not going away anytime soon"
Pokemon Yellow also holds strong scores at the review aggregation sites: GameRankings has it currently scored at 85.12% over 16 reviews whilst on Metacritic Yellow holds a score of 8.8 out of 10 over 222 user ratings.